Today I'm showing the "carpentry" work on the wood which includes the holes made for the butons, routing of the cavity for holding the joystick, and routing of the front edge of the control panel to accept T molding (the plastic that lines the edges of tables and cabinetry). Readers from the start will know that my wish was to use an analogue joystick. Unfortunately, commercial arcade cabinet analaogue joysticks are very expensive (>£100!). I did by a few old PC analogue joysticks with a view to modifying them, but their form factor doesn't make it easy to add into a control panel. Therefore, I decided to use a standard SANWA arcade cabinet digital joystick in the hope that one day I might see an analog joystick bargain on eBay which I could then swap into the VecCab control panel. This approach was the main reason I went for the "top mounted, route double control panel" design. 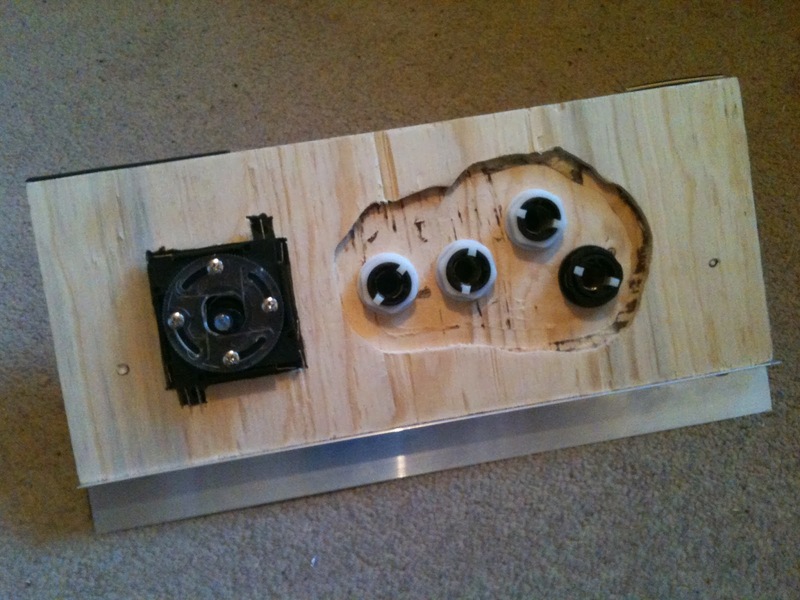 The design allows the screw holes for the joystick to be hidden behind a panel. 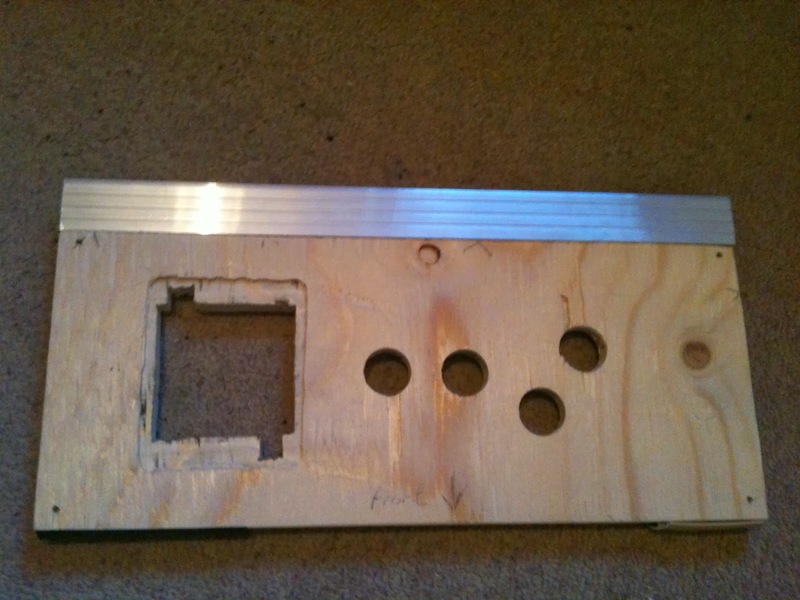 The control panel will be made from wood with a perspex plate acting as the top layer. This means that in the future I can more easily change the joystick for another one, and all that would be required if the joystick foot print is a little bigger than the previous one is further routing of the wood behind the top panel . I already arranged for my mate with a CNC machine to cut a 3mm Perspex panel with holes positioned for the joystick and buttons as per the finalised control panel drawing. I also got him to drill a small countersunk hole at each of the panel corners. 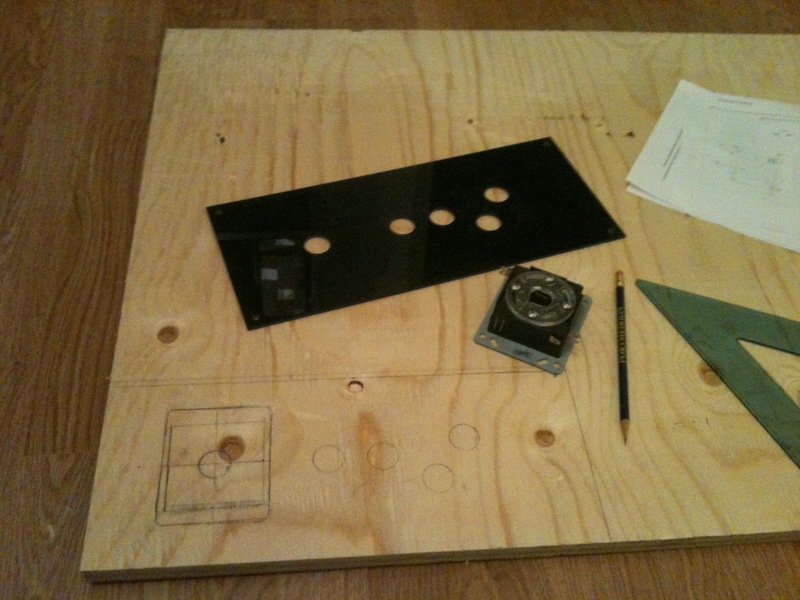 This plate was then used as a template to draw the holes and cut the wood for the control panel base. The foot print of the joystick was also pencilled onto the wood by simply drawing round its edges. The next picture shows the holes that were cut into the wood. You will notice that the hole for the joystick is slightly cut in from the surface. This forms a ledge to allow the joystick to rest on top and remain flush under the Perspex plate. On the underside of the control panel it was necessary to reduce the thickness of the wood to allow the button shafts to comfortably reach through both the Perspex panel and the wood. This was achieved by cutting away a few millimeters from the underside using a router. 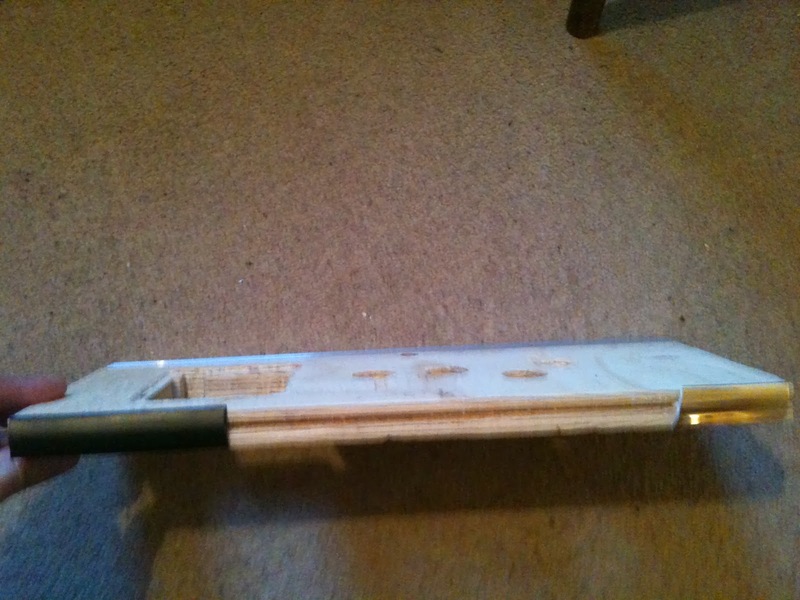 To the rear edge of the wooden control panel base I have attached a length of aluminium angle section. This 19mm x 30mm angle sections type ((item no. 41-2683) from Clas Olson) is the same as I already used for securing the Marquee. The reason for adding this, is to secure/clamp down the bottom of the glass panel on the screen bezel.